This document will serve as a guide for using the new Web Console. Project Selector - Use this to switch between various projects that are reporting crashes or errors. Filters - Define your working set. Specify time frames and additional criteria to indicate which errors and fingerprints to analyze. Saved Views - Commonly access filters for quick access and sharing. 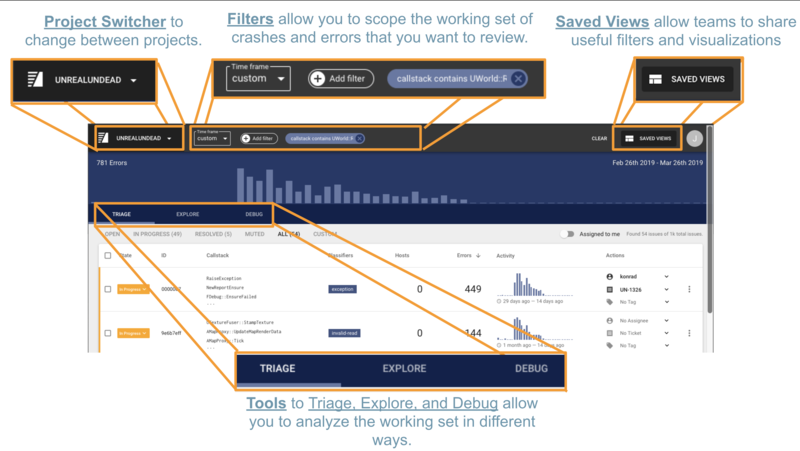 Tools and Result List - Triage, Explore and Debug allow you to prioritize, analyze, and debug your crashes. On the top left, you'll see filters for Time Frame. This allows you to filter for issues that have occurred during a certain time period, or when an issue was first seen, which is useful for identifying when specifically an issue may have been introduced. Next, you can add filters identifying crashes from a certain version, a certain user, specific operating system, or more. Filters are available on any system or custom metadata that you provide with your crashes. You can take advantage of powerful filter operators that go beyond the normal equals or contains operators to include not-contains, regular-expression, inverse-regular-expression, at-least, or at-most, depending on the data type. See the image below for examples of the different operators available. After defining your working set, choose a tools to view and manage the Result List. We'll view the Result List in the context of the triage tool here. The Result List will vary depending on which tool you are in. 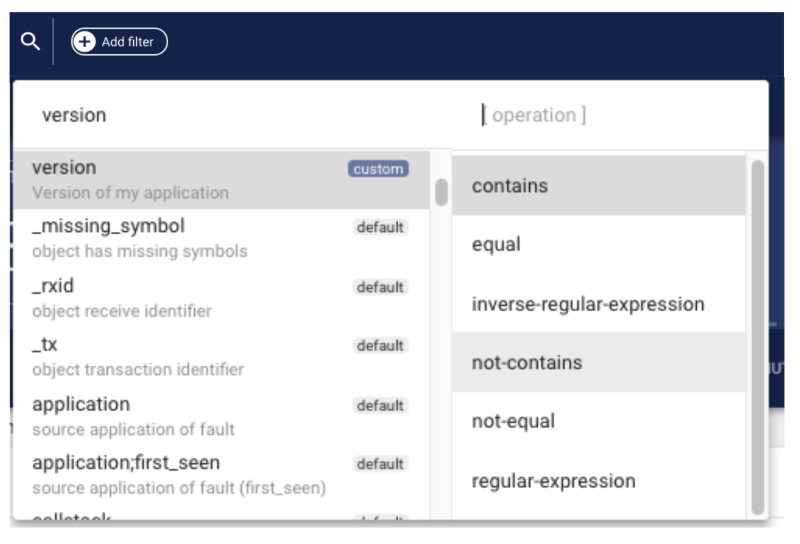 We'll use the Triage tool Result list in the examples below, but make sure to discover the different capabilities offered in Explore and Debug as well. First, at the top of the Result List, you'll see some informational text that tells you how many issues are being displayed and how many in total there are. This gives you a view of how many additional crashes or errors that are identified outside the filter window. Depending on which tool you are in, you have additional ways to manipulate the Result List and continue your exploration of Error data. 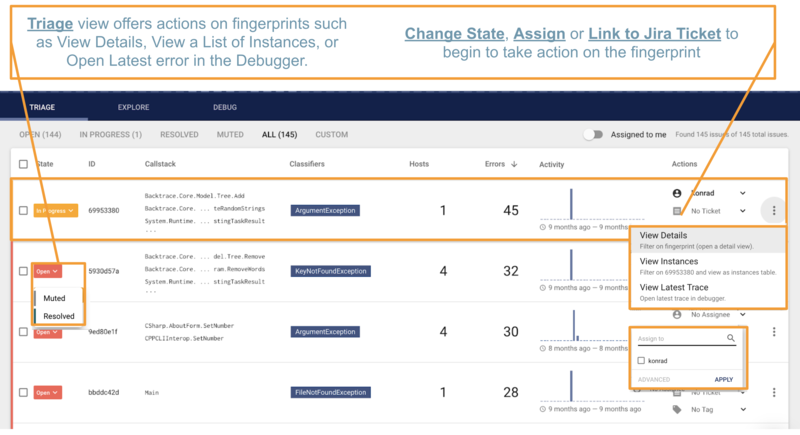 In the Triage tool, you will see errors grouped by Fingerprint. You have various actions available to support resolving the Fingerprint, and you have the ability to open a Details view for the Fingerprint to offer more introspection into the aggregate information about the Fingerprint. In the Explore tool, you will be able to choose which attributes to Group By, allowing for more more robust exploration of your error data. Users will commonly group by UserID (See impact by user), Host or Device ID (See impact to each host), OS Version (Identify issues encountered after an OS patch), or any custom attributes useful for their application. In the Debug tool, you will be able to navigate through all individual errors that are returned based on the filter conditions. This allows you to iterate through a group of similar errors to identify additional trends or commonalities. 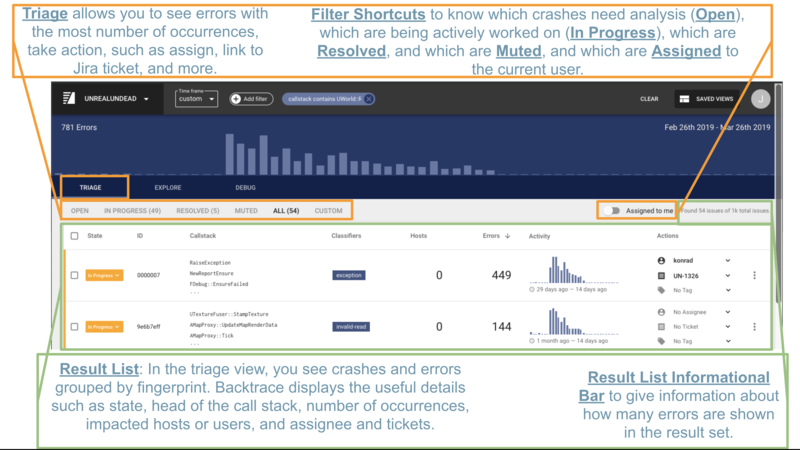 Triage Guide - Allows you to see crashes or errors with the most number of occurrences, and allow you to take action, such as assign, link to Jira ticket, and more. Debug Guide - Allows you to view a specific error report, including a symbolicated call stack, system and custom attributes, and other useful information. The new Web Console provides an enhanced interface and interaction model for working with Backtrace. It was developed to support the needs of team members such as Engineers and Engineering Managers, QA and Support personnel, and Business or Product leaders, as they focus on detecting and resolving issues impacting their newly developed or released software. Engineering Managers - Triage the incoming errors (crashes and exceptions), and review the status of assigned errors. Explore, analyze and query the corpus of error data. Engineers - Debug and resolve errors assigned to them. Possibly self-assign errors not yet assigned. QA Personnel - Review the stability of a new release under development, identify regressions that occur and understand new tests required. Support Staff - Research a problem reported by a customer. Understand if errors have been fixed or what the workaround might be. Business and Product leaders - Understand the overall health of the system. Look for early warning indicators for positive or negative trends.